Need help increasing sales for your Shopify store? Everyone say it with me: There’s an app for that. Actually, there are multiple apps. If you are struggling to increase your sales, don’t panic just yet. 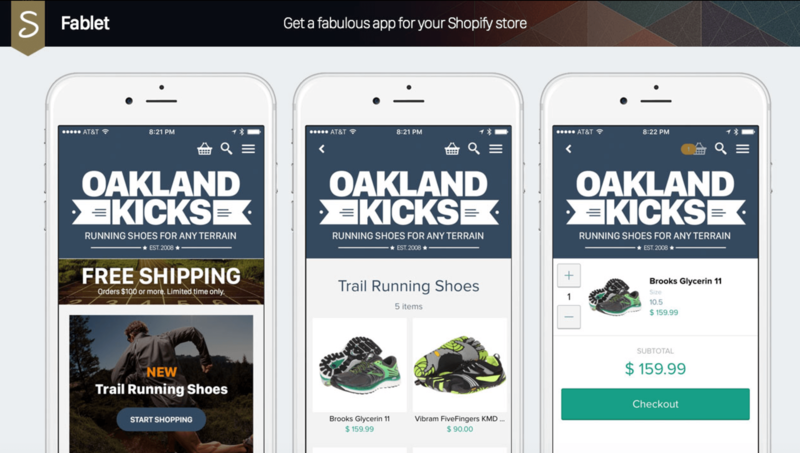 Instead, look at this list of top Shopify apps and see what they can do for your ecommerce store. These 7 apps cover a variety of purposes, all with the ultimate goal of increasing conversions. Running a sale is a more detailed process than you might think, but don’t let that scare you away from the concept all together. Sales are a great way to increase conversions and build up loyal customers. Especially during the holiday season, customers come to expect a variety of sales. Give the people what they want, and you’ll be rewarded with increased business. Product Discount makes running a sale incredibly easy. You can choose from a variety of offers and can schedule when you want them to run, as well as which items you wish to discount. You’ll find that this is much easier than creating discount codes that have to be distributed to customers. 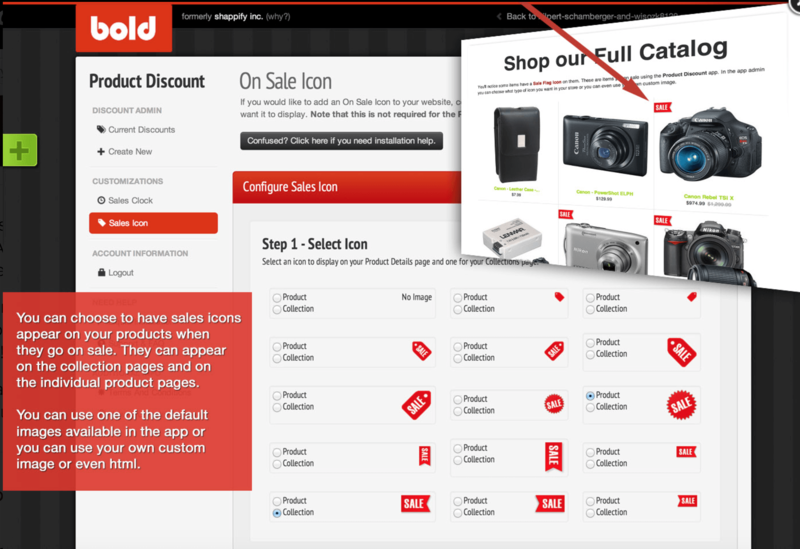 You even have control over what the sale icons will look like: choose a default icon, or use your own custom image. Let’s be honest, the majority of people that navigate to your site leave without making a purchase. In fact, the average conversion rate ranges around 2-3%. That’s it. Even if you have an above average conversion rate, you still have a large percentage of people leave your website without taking any action. Instead of letting these people leave your site (and running the risk that they will never return), you can target them right before they leave to try to entice them to make a purchase. 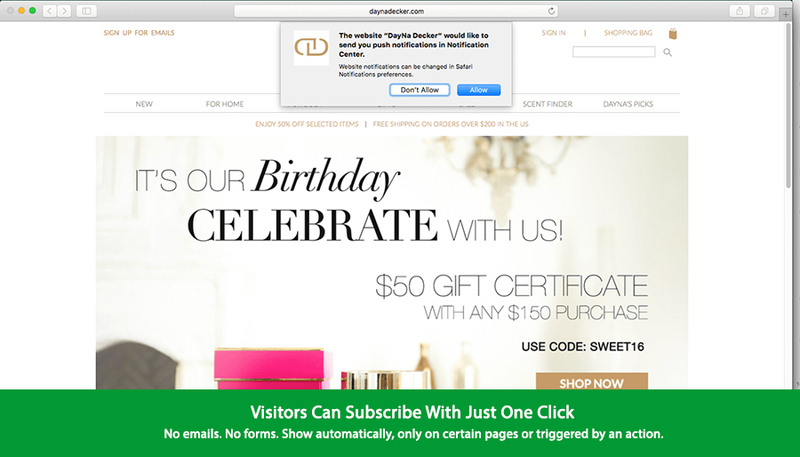 This type of pop-up, typically called an exit offer, usually offers some sort of discount. The hint is in the title. 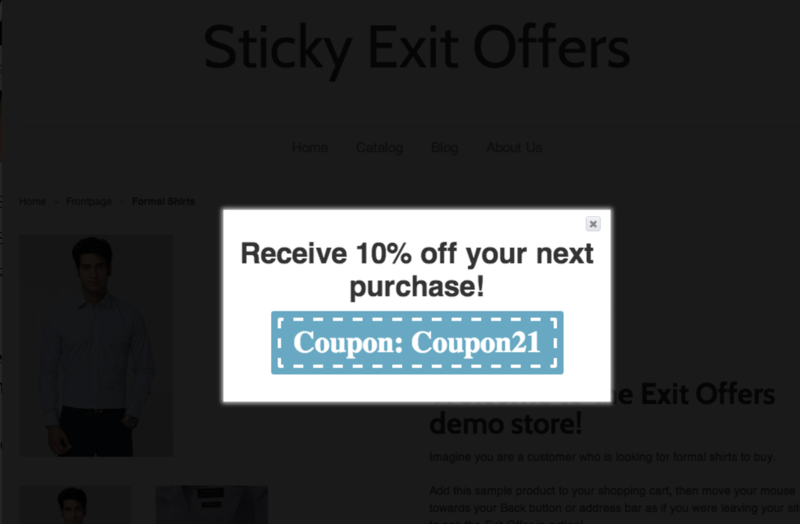 Exit Offers do just that- they present an offer of your choosing right as a user is about to leave your website. With this app, you have full control over what the offer is advertising, as well as when and where the pop-up displays. This app also provides full analytics so you know how well your offers are working and how much money you are generating from them. $9.99/month after a 14-day free trial. Mobile shopping is increasing every year; however, it is still a largely problematic process. Research shows that while users spend 59% of their time on mobile, they only spend 15% of their money there. Why the large discrepancy? Because it is not easy or convenient to shop via mobile for a majority of ecommerce stores. This needs to change, and is changing, as mobile continues to be a large part of our lives. Fablet by ShopPad will turn your Shopify store into a fully functioning mobile store that users can easily navigate. The best part is: no coding is required. This app does all the work for you. While plenty of users still shop from desktop devices, a growing percentage wish to take everything to mobile. Thanks to Fablet you no longer have an excuse to not make this jump as well to include this increasing number of people. : Plans vary from free to $250 per month following a 30-day free trial. The worst way to lose a customer is as a result of the item they want being out of stock. It is already rare that a customer will make the entire journey towards making a purchase without abandoning their efforts. Should they reach the stage of making a conversion, nothing should stand in their way. Having an item out of stock is understandable, but should not be a dead end. Rather, these interested customers should be able to make this purchase when the item becomes available again. Personally having to manage notifying customers when an out of stock item is available again would be a nightmare. Instead, Back in Stock will do all the work for you. This app will install a button that notifies users when an item is out of stock. 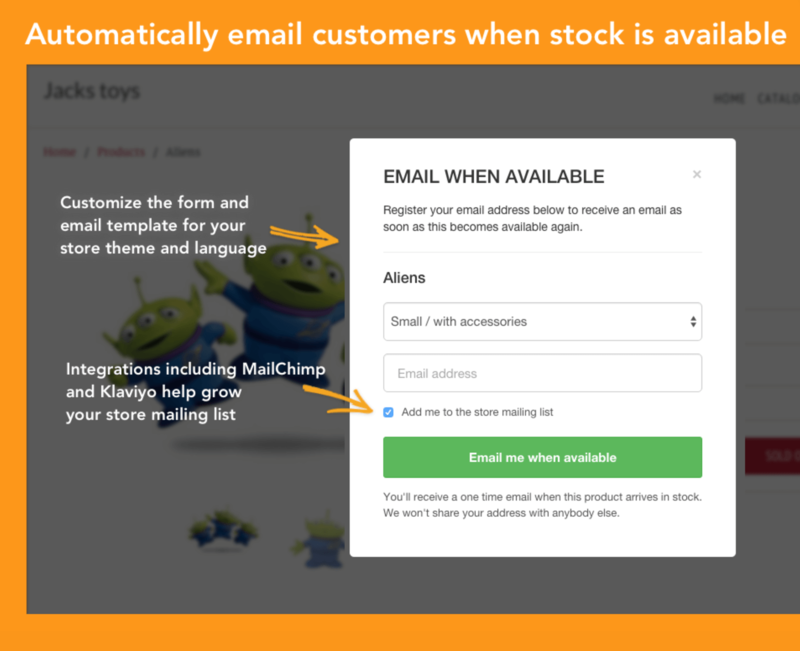 If the user wishes, they can input their information in order to be informed when the item is back in stock. Users get notified about the items they want, and you get a new list of leads. Talk about a win win. Plans vary from $19 to $79 per month following a 30-day free trial. 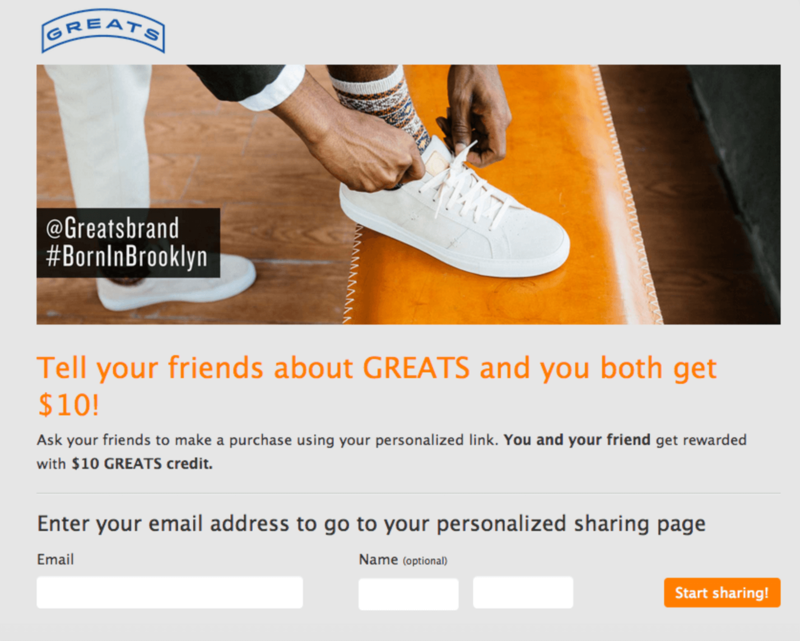 Referral programs: customers love them. And you should too. What makes them so great? One reason is that they benefit both parties. Customers receive incentives for bringing you new customers and you benefit from gaining these new customers. If you aren’t convinced, keep in mind that over 50% of people are likely to give a referral if they are offered some type of reward, and 69% of people are more likely to purchase from a brand that gives rewards. A lack of sales may be resulting from unhappy customers who don’t feel appreciated. Offering them rewards and incentives is a great way to change that. Referral Candy gives you an entire referral system without you having to do a thing. You select the reward, and this app handles the rest. Customers are emailed their unique link that they can share with friends and family. As this link is used, the app tracks everything and distributes rewards accordingly. You simply sit back and enjoy all your new (and happy) customers. : Plans vary from $25 to $195 per month or 1.95% to 7.5% of referral sales after a 30-day free trial. If your problem is that people are not coming to your website, consider placing your shop in other locations where your users are likely to be. Social media, for example, is used by an absolute majority of people. Your users may not be checking your website, but they are likely checking their Facebook. This not only puts your products where your users already are, but also makes it easy for them to see your products and, hopefully, make a purchase. Simple- this app turns your Facebook page into a store. 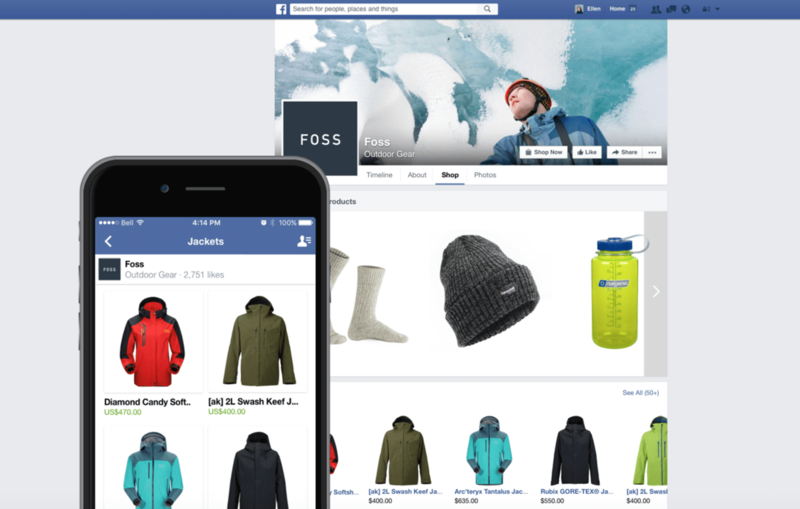 A ‘Shop’ tab is added to your existing Facebook page that will pull up your items and allow customers to make a purchase all without ever having to leave Facebook. Inventory is shared with your Shopify store so that there is no confusion about what items are available. Finally, it is inevitable that your customers will leave your website at some point. You need an app that will help bring them back. Web push notifications retarget your visitors in an effort to do just that. Build campaigns, segment your audience, trigger notifications automatically based on website events, and more. Aimtell allows you to send web push notifications to users on all major browsers (Chrome, Safari, Firefox, Opera). These notifications show up on desktop and mobile devices even when not on your website and when clicked will send users back to a website of your choosing. You have total control over all of your campaigns and can send a variety of manual, scheduled, and triggered campaigns. Visitors to your website subscribe with one click- it couldn’t be easier. : Plans start as low as $29 per month with a 14-day free trial. Tags: digital marketing, ecommerce, shopify, web push notifications.